A resolute defender, Saunders arrived at Footscray via Kingsville. He played six games for the Bulldogs in 1986 before shifting to East Ballarat. 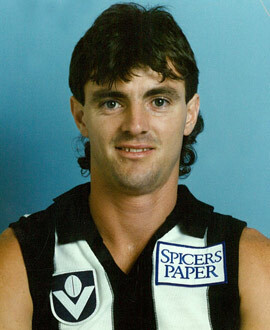 He moved to Victoria Park in 1988 and featured in Collingwood’s semi-final loss to Melbourne a year later. Although never a regular, Saunders was on the fringe of the senior side in 1992-1993 and played four games in the premiership season of 1990. His 50th and final game came against Essendon in round 18, 1993.